Together, the three women join forces in order to embark on the momentous task of setting up the new Tea Chest in what is little more than a rundown ramshackle shell of a shop. Also, they are not without opposition – either from some of the people who run the nearby shops and from Judy, Kate’s financial partner who only wants to get rid of the chain as quickly as possible. Will the women succeed in their task to make the latest Tea Chest a roaring success? Or will Kate have to return to Australia, sell up and admit defeat? The Tea Chest is a truly delightful book and such a satisfying read. I was caught up in the quaint wold of the Tea Chest from the very first page and it was pure pleasure to keep on reading. The story is both poignant and amusing in equal measures. 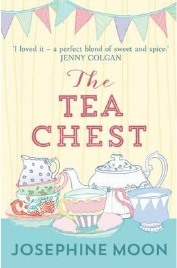 I loved the characters; I loved the whole idea of the Tea Chest; and I loved the story. It is a well written. Relaxing read, just right for curling up with on a summer afternoon or a winter evening. I can’t wait to see what Josephine Moon will write next! No Comments on "The Tea Chest"